Jordan Owens admits the competition for places at Crusaders is “intense” as the Danske Bank Premiership champions prepare to kick-off their title defence. The Crues will be looking to claim three championships on the bounce next term – a feat only achieved by Linfield and Belfast Celtic. It is another challenge Stephen Baxter’s side is relishing as they prepare for the start of the domestic campaign on August 6. Baxter has bolstered his squad during the summer, with the high-profile arrivals of defender Howard Beverland, midfielders Michael Gault, Philip Lowry and David Cushley, and Portadown youngsters Jordan Lyttle and Marcio Soares. It is another statement of intent from the Shore Road men – and one that excites the club’s record goalscorer Owens. “The new signings have come in and gelled really well,” said striker Owens. “Howard did great against Copenhagen and Cush also came on and almost scored a couple. “We have signed players who know the league and we also have young players breaking though. We have a really strong squad of 22 players and everyone is capable of stepping into the side. “We’re all looking forward to the new domestic season and the competition will be intense. There are places up for grabs and everyone will be fighting for a starting shirt. “You need to keep building and strengthening the squad if you want to keep challenging for trophies, and the manager has consistently done that. 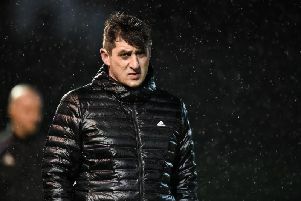 They are preparing for Tuesday night’s return leg at the Telia Parken Stadium and Owens admits it will be another huge clash for the Irish League underdogs. “Last week’s game was tough,” he said. “Copenhagen have been in the Champions League for a number of years now and were great opposition. They moved the ball very quickly. “They are full-time and you could see the tiredness kick in for us in the last 20 minutes, but it was a great workout. “We’ll recharge the batteries and go again. We’ll set a shape up and go with a strategy to try and limit them. “We created chances in the first leg, so that gives us some belief. Of course, it’ll be tougher over there, but our aim is to put in a positive performance and try and restrict them.